November 8, 2018 — DENVER, CO — Colorado’s total health care costs for commercially insured individuals in 2016 increased two percentage points from 2015, according to a new multi-state benchmark analysis released today by the Network for Regional Healthcare Improvement (NRHI). Analysis by the Center for Improving Value in Health Care indicates that Colorado could save over $54 million annually if costs were brought down to the Colorado statewide median. Over $141 million in savings would be realized if total costs were reduced to the multi-state average. 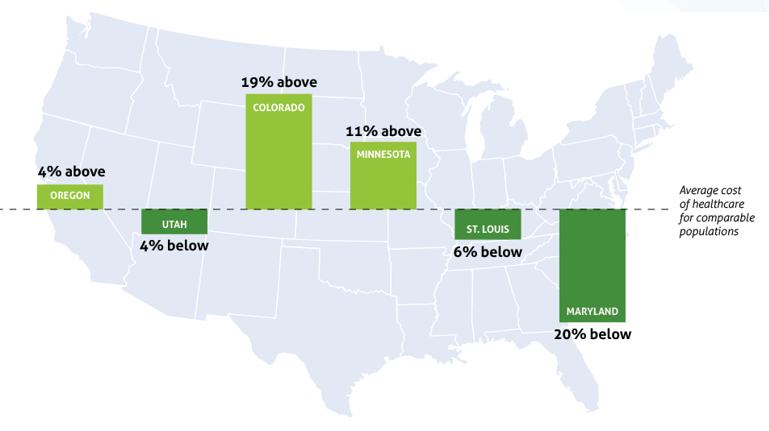 The new report shows that variation in total cost of health care in six states – Colorado, Maryland, Minnesota, Oregon, St. Louis, MO, and Utah – continues to be driven by variation in local patterns of both health care usage and pricing. Colorado’s total cost per person is 19% higher than the six-state average, driven by 5% higher utilization of services and 13% higher prices. 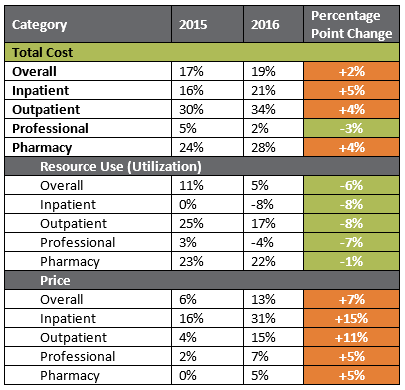 Further breakdown shows that in Colorado, higher prices across Inpatient (31%), Outpatient (15%), Professional (7%), and Pharmacy (5%) are the main drivers of higher total average spend. Colorado is the only state with higher than average prices across all service categories. Oregon also had higher than average prices in all categories with the exception of Pharmacy costs which were 10% below the multi-state average. Compared to 2015 data, Colorado’s average utilization across all service categories has gone down slightly relative to the multi-state benchmark. However, prices are higher in every service category relative to the benchmark, with the highest percentage point increases occurring in the Inpatient (+15%) and Outpatient (+11%) categories. Within Colorado’s borders, cost and utilization varies as well. CIVHC analyzed total costs across the nine Division of Insurance geographic rating areas and found that each region has different cost drivers. Colorado Springs has the lowest total cost at $335 per person per month, driven by 10% lower utilization of services 10% lower prices relative to the statewide median. In the West region, however, total costs are highest at $584 per person per month with 7% higher use of services and 29% higher prices than those observed across all regions. Evaluating total per person costs across commercially insured patients at the 163 adult primary care practices included in the Colorado analysis, if spending for high cost practices was reduced to the state average ($424 per person per month), Colorado could reduce total health care costs by $54 million annually. Additional savings of over $141 million could be realized if total costs in Colorado were reduced to the multi-state average. This is NRHI’s third report comparing the total cost of care for those with private insurance in various U.S. regions, and the second report featuring data from the Colorado All Payer Claims Database (CO APCD). CIVHC has been participating in this effort since its inception five years ago. “There are ways we can work together to change the system, this report provides trusted data and supports Regional Health Information Collaborative multi-stakeholder forums that leverage healthy tension, and local intelligence to address healthcare affordability.” said Ellen Gagnon, Executive Director of Healthcare Affordability, NRHI. As part of this year’s activities, CIVHC provided detailed practice-level reports outlining specific opportunities for change to over 200 adult and pediatric primary care offices that were a part of this analysis. For more information about the practice-level reports and regional variation within Colorado, read CIVHC’s Colorado Total Cost of Care analysis released in February 2018. “Data is the Spark, Collaboration is the Fuel” was developed with support from the Robert Wood Johnson Foundation. The report can be found at: http://www.nrhi.org/uploads/rwj_tcoc_phaseiii_benchmark_2018_r7.pdf. Center for Improving Value in Health Care (CIVHC) is an objective, not-for-profit organization. Through services, health data, and analytics, we partner with Change Agents to drive towards the Triple Aim for all Coloradans. We believe that together we can alter the trajectory of health care and we are privileged to serve those striving toward a better health system for us all. Learn more at civhc.org. The Network for Regional Healthcare Improvement (NRHI) is a national membership organization of regional health improvement collaboratives (RHICs) and partners representing more than 30 states and territories across the US. Our members work in and across their regions to collaborate and transform healthcare with the goal of achieving better health, and high-quality affordable care.